In this review, you’ll get a look at the specifications, features, pros, and cons of the Jumpsport 250 trampoline. You’ll also get a peek at what real users of this trampoline have said about it. In this way, you can decide if it is the right exercise trampoline for your fitness needs. 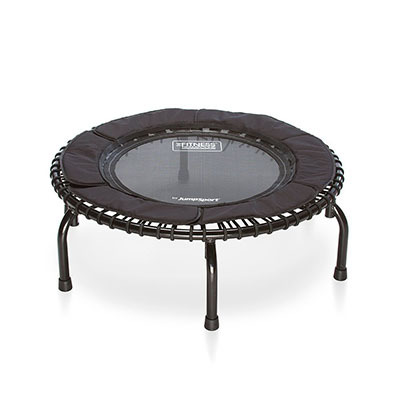 The Jumpsport 250 is an exercise trampoline that is designed to be used in a variety of different ways. It is a bit more costly than other fitness tools of this type, though. This is why it is essential to understand its many features and why it stands apart from others like it on the market today. The weight capacity of this model will vary depending on which variation you purchase. The basic Jumpsport 250 holds up to 250 pounds, hence its name. However, heavier-duty variations will hold up to 275 pounds. That small difference in weight is critical to understand because it means heavier people may enjoy the Jumpsport 250 without fear of it failing them during a physical routine. The many features of this product include the EnduroLast-2 bungees. These are designed to last twice as long as other bungees. On top of that, the arched legs are designed to reduce most of the impact and improve the stability and safety of the trampoline. As a result, it is appropriate as an in-home exercise tool for a large number of people. While children could play on it, they should be supervised by their parents. In some instances, the Jumpsport 250 could be used in smaller gyms. However, it should be used as an inexpensive alternative to more heavy-duty professional trampolines. That’s because while it is quite durable and robust, it might not be the best choice for gyms that expect a lot of business or vigorous exercise on the trampoline. Start by separating all of the parts based on where they will be attached. Sort through the frame parts and place them in the proper shape. Snap the frame sections together and tighten the connectors about 75 percent of the way. Carefully turn the frame over on the top so that the leg holders are in the air. Push each leg into the proper holder and tighten the connecting screws to hold them in place. Put the jumping mat in the frame and flatten it out as much as possible. Even out the mat’s position in the frame and start attaching the springs. Add the springs evenly so that the pressure on the mat and frame is distributed properly. Turn the trampoline over onto its legs and tighten the connectors fully. Place the safety guard on the springs and tie it down using the included strings. If you want to get a better idea of how to use the Jumpsport 250 trampoline, check out this official video. Though short, it does give an insightful look at how to enjoy this trampoline without injury. Use its safety tips to have fun and exercise without difficulty. What Are the User Reviews Saying? These complaints were rare and often contradicted by other reviewers. Most found that paying the higher price for the trampoline was worth it. They were happy with the stability and strength of this model and were able to exercise easily and get into shape quickly and efficiently. Others praised how well it worked with children who simply wanted to have a little bouncing fun. We think that the Jumpsport 250 is a good choice for somebody who wants a high-quality exercise trampoline that can go through a lot of wear and tear. Paying a little more for it over other models is a wise choice if you want a durable product. Don’t hesitate to contact us if you know more about the Jumpsport 250 and want to share your insights about it. Every day in the evening we used to have recreation in our backyard. To make it more pleasant and fun, I have a thought of buying a trampoline. will it be suitable for my kid who is 4 years old?